Total Access Admin is an easy-to-use, standalone program. Simply launch the program and point it to your databases across your network! You'll enjoy seeing the activity in real-time. It's especially helpful if you need to kick out everyone in the database and want to know who's currently in using it. Quickly see who is currently logged into your databases either directly or through linked tables. Total Access Admin supports databases that are password protected or secured through a workgroup file. Multiple databases can be monitored at one time. The workstation name, their Access/Jet login name, and connection status are revealed. Suspect connections are shown and if someone exits, the time they left is shown. Total Access Admin can display the user name for each computer name. Microsoft Access/Jet only knows what computer is connected to a database and not the actual user name. You can now create and maintain a list of computers with their user names to better understand who's in your databases. Provided multiple people aren't using the same computer, this makes it much easier to see who's in your database. Record all the user connections to track when people enter and leave each database. The information is stored in a table in a log database you specify. The data is in MS Access tables, so you can easily query and perform additional analysis on it. This great feature makes it easier than ever to prepare a database for backups, compact/repair, or other maintenance operations. Set at the Access/Jet database engine level, this option prevents new users from opening the database, giving you time to kick out the existing users. (This feature is supported in Jet 4.0 or later and is not available for Access 97 or earlier). When a user leaves their computer on with your Access or Jet/VB database open, it can be impossible to get the database closed for maintenance until you track them down. Use Total Access Admin to automatically log users out of a database after a specified period of inactivity. You can specify the number of seconds it should wait before logging out the user automatically. If you'd like, when all the users exit the database, Total Access Admin can get a full lock and compact the database. This makes it easy to compact the database once everyone exits. Database compact is made with extra care to ensure that a successful copy is made before the original is replaced. Other options include closing the database, displaying a message, and exiting Total Access Admin. A dropped connection to an Access/Jet database can lead to database corruption. 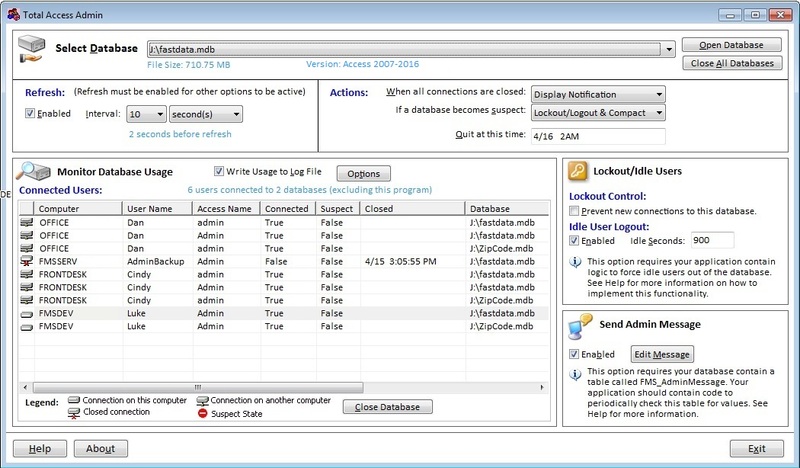 Total Access Admin identifies workstations or users who left the database in a suspect state. This can be invaluable for pinpointing a potential database corruption source. Previously, Total Access Admin could be set to exit for certain actions such as when all users exit the databases. You can now specify a specific time to exit regardless of other activity in your databases. Just specify any date/time in the future. Use Total Access Admin to communicate in real time with your application users. Simply type in a message and it appears in every instance of your application. Great for sending update or maintenance/log-out messages. Total Access Admin can be launched from a command line, Windows shortcut, or batch file. The database name, login info, and all the interactive selections can be set from the command line to simplify repetitive tasks. Total Access Admin runs as a stand alone program. Install and run it from a machine that has a version of Access supporting the database formats desired. Point it to the databases you want to examine and the list of users is displayed. The databases can reside anywhere on your network that you have rights to see. Total Access Admin can also be run from the command line with all the user interface options, making it easy to create a shortcut for regularly checked databases. Technically, Total Access Admin is an LACCDB and LDB Viewer. When you open an Access Jet database (either ACCDB or MDB format), a lock file is created with a *.LACCDB or *.LDB extension. Total Access Admin lets you peek into these files to see who's currently using them. By monitoring them over time, it can determine when people leave, if they break their connections unexpectedly, and to prevent new users from opening the database. Total Access Admin is a member of the award-winning family of Microsoft Access products that make your life easier. Like our Total Access Analyzer and Total Visual Agent products, Total Access Admin makes it easier to maintain your Access and VB6 projects using Microsoft Access databases. Total Access Admin is 100% guaranteed to pay for itself the first time you use it. Easily monitor and maintain Access/Jet Engine databases. Control access and effectively communicate with users. If you are not completely satisfied with Total Access Admin, return it within 30 days for a complete refund. Total Visual Admin supports all recent Microsoft Access/Jet versions. Two versions are available depending on whether you support the ACCDB database format. You do not need to install Access on your machine for Total Access Admin 2016 to perform its tasks. It installs the Access Database Engine (ACE) during the installation process. Total Access Admin is licensed on a per user and installation basis. Each user who runs the program must have a license. Total Access Admin 2003 supports MDB databases. It can be used for environments where you never need to support ACCDB database formats or cannot install ACE. Version 11.6 includes features added to the Access 2013 version. "Total Access Admin is a tool of immense value for any database administrator, so if you are one, don't miss this chance to make your life so much easier!" "Seeing live who's going in and exiting an Access database is incredibly helpful for supporting our multi-user environment"